Bayern Munich extended their lead at the top of the Bundesliga to eight points as they beat Frankfurt and RB Leipzig drew with Mainz. 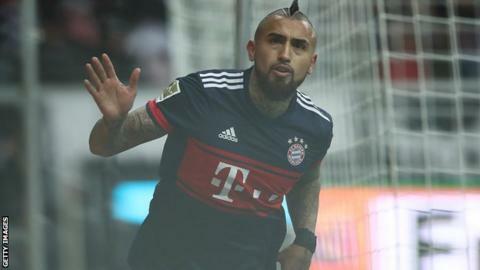 Chile midfielder Arturo Vidal secured victory for Bayern with his fourth goal in his past four Bundesliga games. He met Joshua Kimmich's cross at the far post and headed it in beyond Frankfurt goalkeeper Lukas Hradecky. Marius Wolf was sent off before a consultation with the Virtual Assistant Referee saw it reduced to yellow. The referee dismissed the Frankfurt forward for a second-half challenge on James Rodriguez but changed his mind after viewing it again on a monitor. Bayern's win means they are guaranteed to be top of the table at Christmas for a record 23rd time. RB Leipzig were undone by a late Emil Berggreenstrike as they drew 2-2 with Mainz. Borussia Dortmund have now gone nine games without a win after they were beaten 2-1 by Werder Bremen. Kai Havertz and Lars Bender both scored as Bayer Leverkusen won 2-0 at Stuttgart. Borussia Monchengladbach drew 1-1 with Schalke, while Hamburg and Wolfsburg played out a goalless draw. Match ends, Eintracht Frankfurt 0, FC Bayern München 1. Second Half ends, Eintracht Frankfurt 0, FC Bayern München 1. Offside, FC Bayern München. Corentin Tolisso tries a through ball, but David Alaba is caught offside. Foul by Kevin-Prince Boateng (Eintracht Frankfurt). Corentin Tolisso (FC Bayern München) wins a free kick on the right wing. Offside, FC Bayern München. Jérôme Boateng tries a through ball, but Robert Lewandowski is caught offside. Attempt blocked. Carlos Salcedo (Eintracht Frankfurt) right footed shot from outside the box is blocked. Substitution, FC Bayern München. Robert Lewandowski replaces Kingsley Coman. Substitution, Eintracht Frankfurt. Marc Stendera replaces Aymen Barkok. Attempt missed. Kevin-Prince Boateng (Eintracht Frankfurt) right footed shot from outside the box is high and wide to the right following a corner. Foul by Marius Wolf (Eintracht Frankfurt). Substitution, Eintracht Frankfurt. Taleb Tawatha replaces Jetro Willems. Kevin-Prince Boateng (Eintracht Frankfurt) wins a free kick in the attacking half. Attempt blocked. Kevin-Prince Boateng (Eintracht Frankfurt) right footed shot from outside the box is blocked. Attempt blocked. Marius Wolf (Eintracht Frankfurt) right footed shot from the right side of the box is blocked. Assisted by Aymen Barkok. Offside, FC Bayern München. Kingsley Coman tries a through ball, but Thomas Müller is caught offside. Marius Wolf (Eintracht Frankfurt) is shown the yellow card for a bad foul. Delay in match James Rodríguez (FC Bayern München) because of an injury. Substitution, Eintracht Frankfurt. Luka Jovic replaces Gelson Fernandes. Offside, Eintracht Frankfurt. Simon Falette tries a through ball, but Jetro Willems is caught offside. Substitution, FC Bayern München. David Alaba replaces Franck Ribéry.